The following is a list of case studies involving various types of situational awareness platforms engineered and manufactured by Netarus. 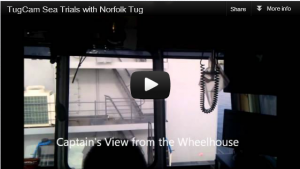 Description: This case study uses the TugCam to increase the visual line-of-sight of the captain during a blind push. The purpose of this trip was to push a 50ft YRBM along the Elizabeth River. With a pilot standing on the front of the barge, the TugCam was installed on the starboard side of the YRBM. The TugCam allowed the captain pushing the YRBM to monitor the crew around the YRBM and see along side the vessel while underway. Description: This case study goes over the installation of the HoistCam and shows the view from operator’s cab as well as the video from the HoistCam. The goal of the HoistCam was to increase the visual line-of-sight for the crane operator on long distance lifts… and especially during blind lifts. 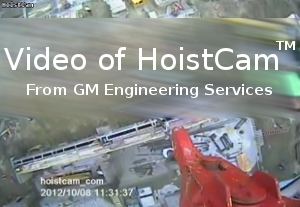 Description: The purpose of this video is to demonstrate the durability of HoistCam. 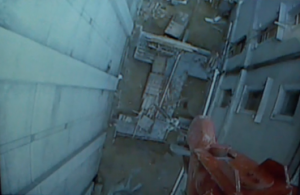 Although dropping a HoistCam from 5 floors is not the intended use of HoistCam, we thought we would do a drop test to help demonstrate the durability of HoistCam. 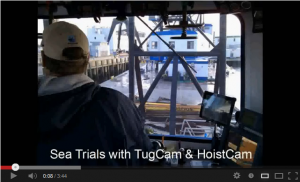 Description: This case study combines the rapidly deployable wireless camera from Netarus first as a TugCam, and then converted to a HoistCam. First, the TugCam is used while pushing a barge with a large marine crane. The TugCam gives the captain line-of-sight in front of the barge during the blind push. Once the barge with the crane is docked near the vessel to unload the cargo, the rapidly deployable wireless camera is mounted as a HoistCam. The HoistCam is mounted onto the hook block of the crane. The case study shows the view of the cargo and the deck of the ship during the blind lift. 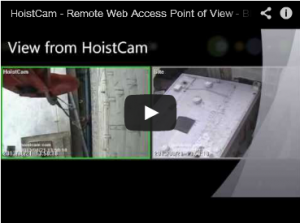 Description: The following case study is an example of how the HoistCam camera system for cranes can be used virtually anywhere in the shipyard. The HoistCam’s rugged housing and wireless transmission capabilities allow it to be placed anywhere. 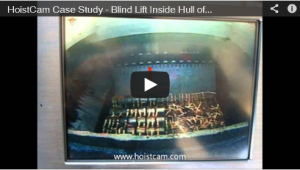 This video provides an example case study with pictures of how the rigger and crane operator used the HoistCam to assist them with a blind lift of cold rolled steel from inside the hull of a cargo ship. The results of using the HoistCam increased the safety rating above 90% and the efficiency of the unloading was reduced from 9 hours to 4 hours. This is a 55%+ increase in productivity and efficiency. * This increase in efficiency was due to the lift no longer being a blind lift from inside the hull of the cargo ship. Description: Beside giving direct line-of-sight to the crane operation, the HoistCam remote web access feature allows managers and site supervisors to view the site from the HoistCam’s point of view from anywhere in the world. All of these capabilities are included in just one system. You can manage your projects better with visual information. This can be done in seconds from any mobile device – always from a close-up HoistCam perspective. Using any Apple, Android or Blackberry PC, smartphone, or tablet, managers and supervisors can get valuable site information in a matter of seconds from a HoistCam’s perspective. *Disclaimer: These videos do not guarantee that your organization will have the same results. Individual results may vary based on effort, experience, conditions and other unknown factors.